So MUCH has been going on with Freshie & Zero this past month - it's been the proverbial whirlwind! In case you've missed our social media updates, here are the April highlights. 1. Happy 8th Birthday to us! We hosted three giveaways throughout the month of April to celebrate our birthday and now three lucky ladies have claimed their prizes! 2. 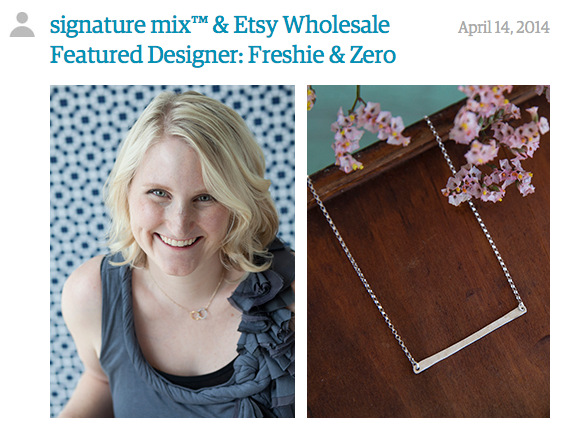 We were featured on Etsy's Wholesale Blog as part of the upcoming Signature Mix show in New York! You can see the "Meet the Vendor" article on us here. 3. Our "Love" bracelet sold exclusively through UncommonGoods was chosen for a review by Renae of Simple Sequins. "This one spoke to me. Fine materials were used to make it. The quality is fabulous." Read the entire review here. 4. We welcomed our Campus Rep, Maggie, from Belmont University to the Freshie & Zero team. She picked out a pair of Lolly Earrings and Single Chevron Necklace to sport around campus. 5. Aeolidia featured us in their "Building a Business: Don’t Count on Luck" article. Wow! We are honored to be included in such great company! 6. We were also thrilled to be included on Cool Mom Picks! They think our jewelry is a great gift for Mother's Day because it leaves enough money in your budget for flowers, too. We couldn't agree more! Bring it on May! We can't wait to see what you have in store for us!